I had a million ideas when my friends at Flatout challenged me to create a recipe with the theme “your favorite flatbread wrap.” I mean, I’m already pretty in love with the Spicy Southwest Chicken Wraps I posted back in January. I decided to change it up and cook with a protein I use less often: steak! I based these Black and Blue Steak Wraps on one of my favorite salads to order out at a restaurant. I absolutely adore spicy blackened Cajun seasoning with beef and I think it pairs really well with something rich and creamy like crumbled blue cheese. Add in some tangy balsamic vinaigrette, lettuce and tomato and wrap it all up in my favorite light original Flatout flatbread and you have a hearty, filling and absolutely delicious lunch or dinner option. You won’t believe how easy these are to make! 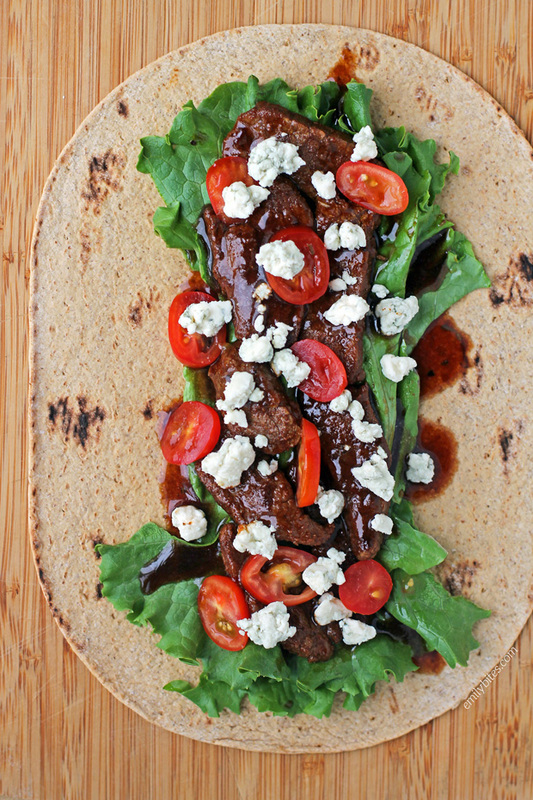 These Black and Blue Steak Wraps can be served with hot steak right off the stovetop or cold/room temp – they taste great both ways! The recipe can easily be doubled or tripled to feed the family or halved to feed one. Each wrap is only 326 calories or 8 Weight Watchers SmartPoints each AND each contains 31 grams of protein and 9 grams of fiber. That will help keep you satisfied all day long! Also, since I know some of you are blue cheese haters, you can definitely sub in another creamy, crumbly cheese like goat cheese or feta if you prefer! Looking for more Flatout recipes? Check out my Spicy Southwest Chicken Wraps, Buffalo Chicken Pinwheel Wraps, Spinach Artichoke Flatbreads, Greek Snack Flats, Mexi Burgers with Guacamole, Chinese Chicken Wrap, Chicken Pesto Flatbreads and Bacon Cheeseburger Wraps. Place the uncooked steak strips into a Ziploc bag and sprinkle with the blackened seasoning. Seal the bag and shake/massage until the steak is coated with the seasoning. Bring 1 teaspoon of the canola oil over medium heat in a medium sized skillet. When the oil is hot, add the steak strips and stir them around to coat with oil. Arrange them into a single layer and cook for 3-5 minutes, flipping occasionally, until the steak strips are cooked to taste. Remove the steak to a side plate. I haven’t had flat-out wraps in a while, but this looks amazing and I’m totally going to make it. I’m also a relapsed LifeTime Weight Watcher who just made it back to LifeTime status. Yay!! I love Flatout Flatbreads and eat them all the time. This recipe looks absolutely amazing. I can’t wait to give it a try. Thanks for posting it. Maybe feta or goat cheese? I really, really don’t like blue cheese, but otherwise this sounds delicious and it is low carb enough for me with diabetes. How do you think it would taste if I substituted Feta cheese? I think my husband would really like this, too. I’ve been trying hard to get him to follow me on Weight Watchers. He is a born and raised Louisiana Cajun and their diet, although tasty, is VERY unhealthy! Back on WW after having a baby. These look great! Just wondering if you happen to have the sodium content for this, trying to watch that lately after BP issues with pregnancy. Thanks!! 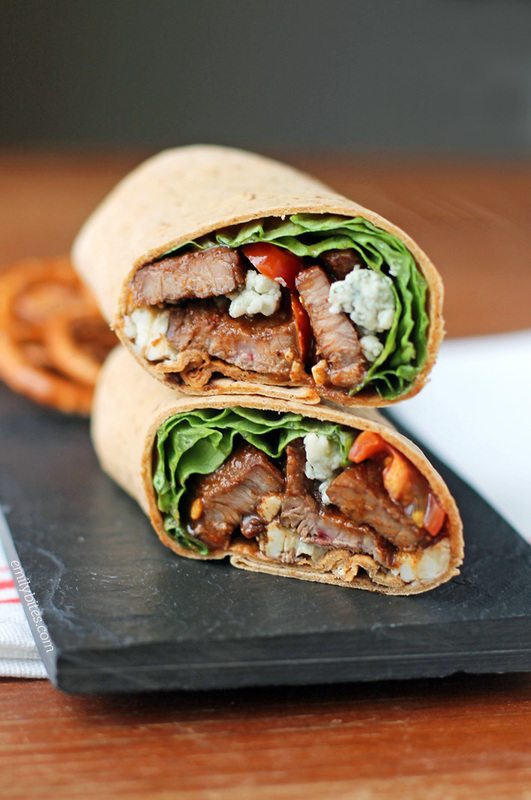 Blue and blue steak wraps are the best things.